Amana | Activations & Events | Brands in Action | Direct Marketing S.A.
For more than 140 years, Amana has been an innovator in design and performance reflecting the original values of pride and commitment to lasting quality. To introduce customers to Amana’s unique line of superior, easy-to-use refrigerators, the brand’s local representative asked for our help to organize the first Amana Private Sale Event in the Middle East. We tapped into our database of contacts to build a shortlist of key influencers and very important persons in a variety of sectors. For these recipients, we developed an original invitation box, containing an invitation letter, Amana catalogues, ideas for kitchen decoration, and a branded premium dark chocolate tablet. It was a conviction that the targeted people deserved a distinguished and exclusive time to discover Amana’s high-quality refrigerators that slide painlessly into daily life, like the newly launched side-by-side model. At the Wakim Group showroom, a representative from the Amana Corporation USA guided guests through the infinite options and features of the Amana line. For more convenience, a private phone line was established to arrange the finest and most relaxed Amana tour experience for interested individuals. 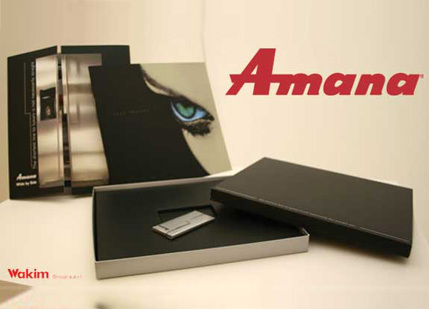 The show and tell not only allowed audience members to personally interact with the brand, but also helped convert some of them to happy Amana owners.